Giving people the courage to speak and the wisdom to write is the lifelong passion of bestselling author Christina Baldwin. 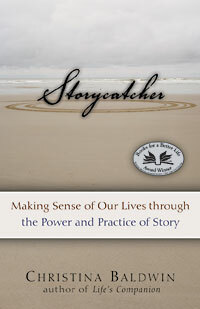 In her award-winning book Storycatcher: Making Sense of Our Lives through the Power and Practice of Story, she reminds us of the important role story has played in the human experience throughout history. She believes revitalizing the practice of story in our families, workplaces, and communities is especially important in modern times because it has the power to shape culture and forecast what will become of our world. We hope you’ll enjoy this excerpt from the book. Dusk, and the room glows only in candlelight for no one has wanted to move toward the lamps. Though twilight sits at our shoulders, we do not want to disturb the delicate attentiveness that hangs suspended between us. There is a palpable sense of compassion and respect in the room. Eyes glisten with tears and laughter. This is story space. This is what happens when people set aside everything else and listen to each other with such quality of attention that speaking and listening become like meditation. Our whole way of being with one another subtly shifts: we become the ear in the heart. I can tell you these stories, and I will. Come listen. Come read. Lean into this space ready to receive and to give the gift of story. What is accentuated here in my living room is the reciprocal nature of story space. One by one we take turns speaking or reading while everyone else listens: one offers, eleven receive, the next one offers, eleven receive again. The rhythm of this, the tempo and cadence of our words, and the quality of attention to our listening connect us to tens of thousands of years learning just this — how to catch stories. There is a television in this room, but it is unplugged and the convex distortion of its blank screen turned discreetly aside. There is an audio system in the corner with rows of CDs and an iPod and it is silent. The telephone ringer and email alert are muted. The digital melodies and buzzers and vibrators are turned off on the cell phones and pagers in our pockets. Beyond this room, families and friends carry on the business of our lives and allow us to attend for a while just to each other. Beyond this room, the pace of modern life goes racing by, but we are not caught up in it. We are storycatching. Storycatching is an experience of time out of time; there is a rich complexity to what happens that is deeper than what we expect in minute-by-minute time. Inside the weave of attentiveness, we make intuitive and imaginative leaps. We who are listening follow the thread of narrative; the one who is speaking takes us into another time and place, an event and setting, and introduces us to a cast of characters who become real to us solely through the magic of language. We anticipate where the story is heading and it creates a kind of synergy, a way we hold the speaker to the track of the tale. We bring our words to each other in the flickering light. The stories we share tonight build a connectedness that will sustain itself long after we have parted and returned to our separate lives. Months from now, one member of this circle, a woman named Stormy, will fly in to a remote cabin in Alaska intending to spend the winter working on her memoirs of life as a Wyoming police officer. By radiophone and email, she will reach out for the support of this group and we will understand what to offer because we know her story. Two months from now, Karen, another woman in this weave of twilight, will be diagnosed with advanced cancer and her friend Patsy will let us know. Her death must already be in her, spreading undetected while we sit laughing at her exuberance and wit. She will move into the home of her daughter to leave her final story in the hearts of two young granddaughters. practitioners of the heart of language. We are sitting this evening in low chairs in a circle around a coffee table illuminated with candles and decorated with objects that each of us has brought because of their relationship to the stories we share. Here is a stone from the beach in France . . . here is a photo of our wedding day . . . here is a button off my grandfather’s favorite sweater . . . here are the immigration papers . . . the adoption papers . . . the old wooden spoon . . . an heirloom brooch . . . a lock of baby hair . . . a photo of my granddaughters dressed as faeries . . . Each object has served as the source of the story. This time we are a dozen people, women and men ages thirty-seven to seventy, from across the United States and Canada. We have spent five days together in a creative process that focuses on writing a defining moment in our lives. We have met in this circle to talk about the craft of story, to respond to questions that open the mind’s internal gateways, and to write in our journals and notepads and laptop computers. Housed on the grounds of a small local retreat center, we have gathered on an island just north of Seattle, Washington, and settled into story-time. We have gone hiking and beachcombing, taken restorative naps, eaten delicious meals, and curled up in cubbyholes of solitude supported by the quiet presence of the group. We have talked and talked and listened and listened. All this while, we have engaged in a profound and simple act: we are remembering who we are and seeing others for who they really are. Storycatchers believe that the ordinary stories of our ordinary lives have extraordinary gifts coded within them — for the one speaking and for the ones listening; for the one writing and for the one reading. Storycatchers are intrigued with making — perhaps driven to make — sense of experience and to make stories out of our sense. Sometimes Storycatchers are provocative, disturbing the status quo with a probing question or statement. Often Storycatchers are a gift, the people others count on to make a story that will get us through the chaos. Christina Baldwin is the author of Storycatcher: Making Sense of our Lives through the Power and Practice of Story and numerous other titles, including Seven Whispers: A Spiritual Practice for Times Like These. She is a writer, a seminar presenter with thirty-plus years’ experience, and a cofounder of PeerSpirit Inc., an educational company devoted to building and sustaining a culture of conversation. You can visit her online at PeerSpirit.com. Excerpted from the book Storycatcher. Copyright © 2007 by Christina Baldwin.